3-Ella Isabell Walker was born on 19 Feb 1895 in Deloraine, Tasmania and died on 18 Apr 1971 at age 76. Ella married Russell Burns Ralston, son of Alexander Mackinson Ralston and Ada Eliza Heaven Giles, on 23 Jun 1920 in Launceston. Russell was born on 15 May 1898 in Westbury, Tasmania and died on 9 Oct 1978 in Circular Head, Tasmania at age 80. When her father died Ella was only nine years old, still at school. She was still at home when her mother died, thereafter keeping house for brother Wilfred until she married Russell Ralston on 23rd July 1920. 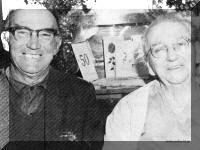 They lived at Rose Hill, Dunorlan, before moving to Marrawah in 1941. At Marrawah they were actively associated with the provision of equipment and facilities for the school, then occupied by somewhat over 30 children. In addition to sporting equipment, a workshop and shelter shed were provided. Russell and Ella enthusiastically supported both the Marrawah School Show and the fundraising campaign associated with proposals for a new hall. Russell, a qualified blacksmith turned farmer, imparted his skills to many of the boys at Marrawah School. After leaving Marrawah in 1950, Russell managed a three hundred acre grazing property owned by the Mowbray Land Development Company at Nabageena. Two years later he transferred to manage the Company's 418 acre property at Mella, where he was in charge of the first modern piggery in the Circular Head area. The Mella 15 pen piggery introduced the intensive pig raising system in the district. Russell was also a key figure in the introduction of beet cropping as a source of pig fodder. 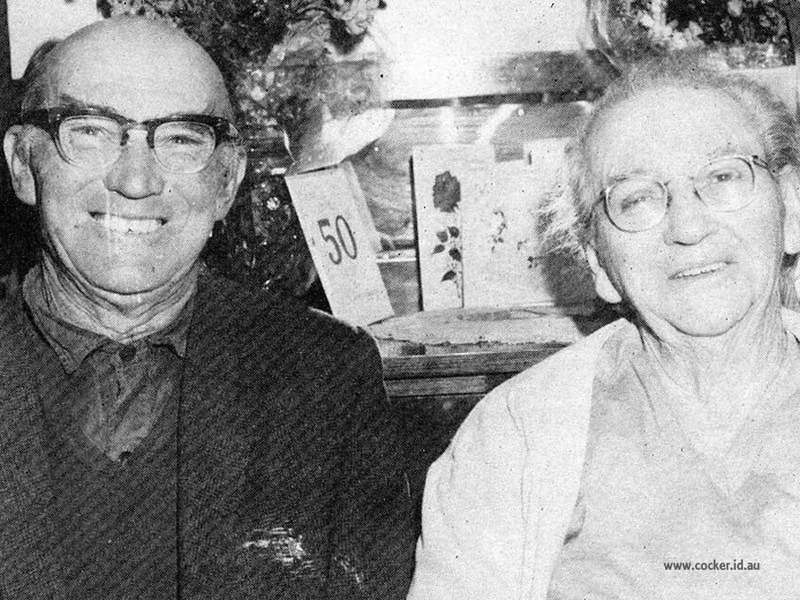 Ella and Russell celebrated their golden wedding anniversary in 1970. Ella died on 18th April, 1971, and Russell on 9th October, 1978. The branch of William may be fairly described as venturesome, perhaps because of the Scotch blood Jane brought into the family. During the period under discussion the Scot was regarded as a great wanderer, figuring in the old family saying that whoever finally reached the South Pole would find a Scotchman sitting on it. Also, New Zealand beckoned as a land of opportunity either for settlement or for rapidly acquiring a stake in life. Thomas Edwin Parsons, whose daughter Gwen entered the branch of John by marriage, worked for some time in New Zealand as a carriage painter, returning to Tasmania with a large sum in cash on his person and a revolver in his pocket. The revolver accompanied him to World War I, but was lost when his effects were returned to Tasmania after his death in action. The branch of William stands out as a group of solid, worthy citizens, striving to reach and maintain the standards of behaviour set by parents and grandparents. Many of their members could truthfully have echoed the dying words of King Alfred the Great. So long as I have lived, I have striven to live worthily. 4-Alvin Max Ralston was born on 12 May 1922. 4-Jack Bruce Ralston was born on 20 Feb 1927. Jack married Daphne Smith. Daphne was born on 26 Aug 1925. 4-Mavis Katherine Ralston was born on 25 Feb 1928. Mavis married Ronald Kingston. Ronald was born on 15 Dec 1925 and died on 22 Jun 1956 at age 30. They had three children: Betty, Elaine and Lynette. 5-Betty Kingston was born on 21 Dec 1950. Betty married Edward Bower. Edward was born on 26 May 1946. They had five children: Kelli, Alisha, Jacie, Rebecca and Tomica. 6-Kelli Bower was born on 1 Jan 1970. Kelli married Murray Horton. They had one daughter: Tori Renae. 7-Tori Renae Horton was born on 15 Aug 1993. 6-Alisha Bower was born on 8 Nov 1972. Alisha married Brett Anderson. They had two children: Jaymi Lea and Brittany Jayne. 7-Jaymi Lea Anderson was born on 25 Nov 1992. 7-Brittany Jayne Anderson was born on 25 Jul 1994. 6-Jacie Bower was born on 30 May 1974. 6-Rebecca Bower was born on 19 Mar 1977. 6-Tomica Bower was born on 15 Nov 1979. Betty next married Mervyn Kaye. 5-Elaine Kingston was born on 18 Oct 1952. Elaine married Jimmy Maccullock. Jimmy was born on 9 Oct 1947. They had three children: Cindy, David and Scott. 6-Cindy Maccullock was born on 28 Nov 1970. 6-David Maccullock was born on 10 Oct 1972. 6-Scott Maccullock was born on 10 Aug 1974. 5-Lynette Kingston was born on 14 Jul 1954. Lynette married Allan Wriggler. They had two children: Shane and Jody. 6-Shane Wriggler was born on 23 Jul 1978. 6-Jody Wriggler was born on 12 Jan 1981. Mavis next married Harry Hume. Harry was born on 29 Dec 1927. They had four children: Sharon, Debra, Leslie and Barbara. 5-Sharon Hume was born on 1 May 1960. 5-Debra Hume was born on 10 Apr 1962. 5-Leslie Hume was born on 16 Dec 1963. 5-Barbara Hume was born on 1 Nov 1966. 4-David Russell Ralston was born on 7 Oct 1931. David married Faye Harrison. Faye was born on 25 Feb 1932. They had five children: Donald Russell, Gaylene Anne, Glen James, Lauren and Carolyn Maree. 5-Donald Russell Ralston was born on 17 Dec 1953. Donald married Helen Maree Jagear. Helen was born on 23 Jun 1957. They had four children: Jay Russell, Adam Xavier, Ashley Darwin and Tony James. 6-Jay Russell Ralston was born on 26 Feb 1981. 6-Adam Xavier Ralston was born on 26 May 1982. 6-Ashley Darwin Ralston was born on 22 Sep 1984. 6-Tony James Ralston was born on 22 Sep 1984. 5-Gaylene Anne Ralston was born on 19 Sep 1955. Gaylene married Milton Harry De Jonge. Milton was born on 24 Feb 1956. They had two children: Kurt Arthur and Clinton George. 6-Kurt Arthur De Jonge was born on 29 Jan 1984. 6-Clinton George De Jonge was born on 27 Aug 1986. 5-Glen James Ralston was born on 14 Oct 1962. Glen married Jacquiline. Jacquiline was born on 1 Aug 1962. They had two children: Megan and Emma. 6-Megan Ralston was born on 22 Nov 1988. 6-Emma Ralston was born on 21 May 1991. 5-Lauren Ralston was born on 22 Jun 1964. 5-Carolyn Maree Ralston was born on 14 May 1965. Carolyn married Dale Newell. Dale was born on 22 Dec 1959. They had two children: Ayden and Calern Thomas. 6-Ayden Newell was born on 13 Apr 1992. 6-Calern Thomas Newell was born on 31 Oct 1994. 4-Jean Isobel Ralston was born on 2 Sep 1933. Another name for Jean is June. Jean married Roy Bernard Odgers. Roy was born on 14 Feb 1923. They had seven children: Gerald Roy, Murray William, Barry Hilton, Darrell Allen, Kerrin Lyle, Craig Russell and Shari Lea. 5-Gerald Roy Odgers was born on 23 Dec 1952. Gerald married Jennifer Louise Mitchell. Jennifer was born on 24 Jul 1955. They had one daughter: Kelly Elizabeth. 6-Kelly Elizabeth Odgers was born on 12 Feb 1973. 5-Murray William Odgers was born on 10 Mar 1954. Murray married Wendy Rae Harris. Wendy was born on 15 Jan 1955. They had three children: Caine William, Mathew John and Sarah Jane. 6-Caine William Odgers was born on 24 Aug 1975. 6-Mathew John Odgers was born on 17 Mar 1978 and died on 28 Jan 2005 at age 26. 6-Sarah Jane Odgers was born on 19 Feb 1980. 5-Barry Hilton Odgers was born on 11 Jul 1956. Barry married Margaret Anne Wescombe. Margaret was born on 10 Oct 1954. They had one son: Stuart Russell. 6-Stuart Russell Odgers was born on 31 Mar 1982. 5-Darrell Allen Odgers was born on 7 Mar 1958. Darrell married Sally Patricia Farrell. Sally was born on 26 Nov 1957. They had two children: James Allen and Tegan Maria. 6-James Allen Odgers was born on 17 Dec 1980. 6-Tegan Maria Odgers was born on 5 Apr 1984. 5-Kerrin Lyle Odgers was born on 29 Dec 1959 and died on 11 Apr 1982 at age 22. 5-Craig Russell Odgers was born on 7 Apr 1961. Craig married Vicki Morris. Vicki was born on 20 Aug 1961. 5-Shari Lea Odgers was born on 26 Oct 1966. Shari married Andrew Williamson, son of Harold Williamson and Ellenor Smith. Andrew was born on 8 Aug 1961. They had one daughter: Karena Lea. 6-Karena Lea Williamson was born on 24 Nov 1987. 4-Murray Burns Ralston was born on 1 Apr 1938. Murray married Judy Garland. Judy was born on 16 Jan 1942. They had four children: John, Darren, Linda and Barry. 5-John Ralston was born on 27 Mar 1965. John married Katrina Bonney, daughter of Raymond George Bonney and Caroline Ann French. 5-Darren Ralston was born on 19 Sep 1967. 5-Linda Ralston was born on 12 Nov 1971. Linda married Phillip Robinson. They had two children: Emily Ann and Amy Lee. 6-Emily Ann Robinson was born on 28 Apr 1993. 6-Amy Lee Robinson was born on 6 May 1995. 5-Barry Ralston was born on 23 Aug 1973.